This video teaches how the Fridge Defend keeps your fridge alive, we have a newer video on the same subject, please click the link below to view newer video. points to the boiler assembly tubing of the cooling unit. Please see ( Dometic & Norcold Fridge How Works ) for the location of the boiler assembly on the SPAR. 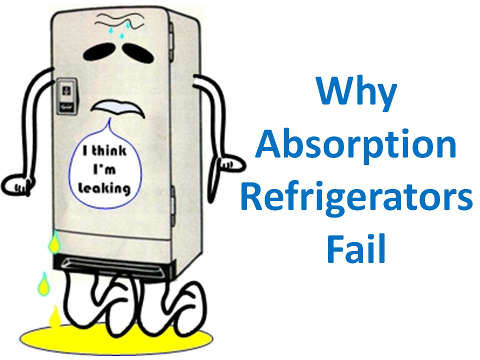 View the YouTube video link above to understand the following discussion as to why absorption refrigerators fail and one of the Norcold fridge problems. points to the gas burner flue (also see: RV Fridge Flame ). The gas burner flue is welded to the cooling unit tubing on the back side of the flue as seen in this photo. Along the weld, heat from the flue is conducted into the cooling unit boiler assembly tubing. points to the weld between the boiler tubing of the cooling unit and the electric heater housing. points to the bottom of the electric heater housing. points to the circle showing a stress concentration area, with a crack penetrating the cooling unit tubing. This crack allows the pressurized contents of the cooling unit to escape. Once the cooling unit cracks, the refrigerator is damaged to the point that replacement of the whole refrigerator is most often the economical solution to the problem. In addition, fires have been reported due to cooling unit failure because hydrogen and ammonia gas are within the cooling unit. points to the stress crack which ruptured this cooling unit. The cooling unit on a RV refrigerator is considered a thin walled pressure vessel. The tubing making up the cooling unit is steel which is welded together. Cooling units are rigorously tested for proper construction so they are very safe. The sodium chromate in the cooling unit keeps the water within the cooling unit from causing corrosion. Off level overheating of the boiler assembly can alter the composition of the sodium chromate, where the sodium chromate loses its ability to inhibit corrosion causing internal corrosion of the cooling unit tubing which may result in rupture. The sodium chromate may also cause blockage in the cooling unit. The elevated temperatures at the boiler result in excess stress on the boiler assembly tubing when the phase change of the ammonia is not absorbing the heat input. 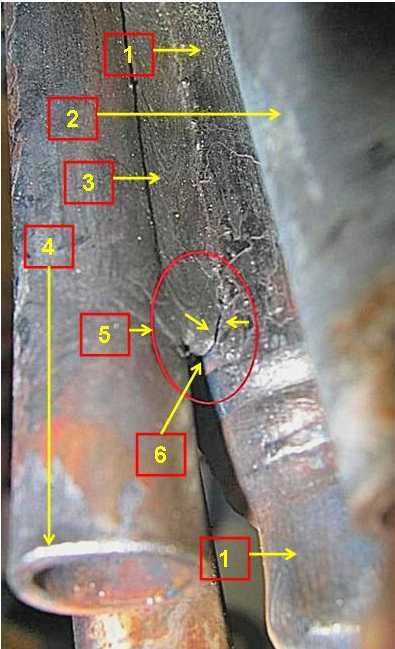 This particular crack/rupture type failure is at the end of a welded joint where stress naturally concentrates. The above picture and content hopefully help you understand why RV refrigerators fail. 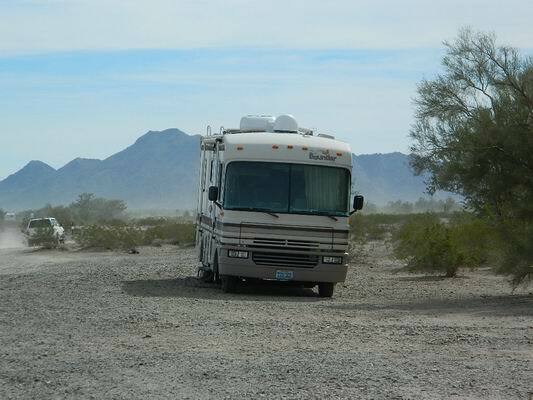 This photo is a classic example of an RV "Parked" off-level where the ARP Control would have saved the fridge from failure because no RV leveling blocks were used. Some folks may say, "I have parked my RV off level -- I have not had damage done to my refrigerator". Avoid another Norcold fridge problem, often the damage that is done is cumulative from off level use this is why this type of damage does not show up immediately. Each time the boiler overheats, damage is done to the refrigerator. With the accumulation of off level overheating the refrigerator loses efficiency, thus in warm weather the refrigerator may run all the time and only cool to 55ยบF in the refrigeration compartment. Often, the damage will result in no cooling at all above a certain ambient temperature. How does the ARP Control Help in this Situation? The ARP control keeps the boiler assembly below the temperatures that result in excessive stress on the cooling unit tubing and keeps the fluids contained within the cooling unit at levels and phases that result in a long life for the refrigerator ( See RV Fridge Off Level ). These cooling units are tested to withstand normal temperatures and operate safely, the ARP control insures these normal temperatures are not exceeded. Therefore, the best preventative defense for RV refrigerator boiler overheating and causing fires is the ARP Control!